Francis was born at Calderola in the diocese of Camerino. Faithful to the call of God to become a Franciscan, he joined the Friars Minor of the province of the March. The great Saint James of the March and other holy men lived in the order at that time and were brilliant models for the younger brethren. Francis strove earnestly to follow in the footsteps of these saintly men. After his ordination to the priesthood, he was consumed with an insatiable zeal for the salvation of souls, and was occupied for days at a time with preaching and hearing confessions. Then at night he would join in singing the praises of God and spent many an hour in private prayer for strength and blessing on his apostolate. Although Blessed Francis was a very learned man, he always addressed the people in language that was simple and not above their comprehension. He took great delight in relating anecdotes from the lives of the saints and in encouraging his listeners to follow their example. Wherever the blessed man went, he soon gained the confidence of the people, and as a result he was able to reconcile many enemies and to settle long-standing feuds. 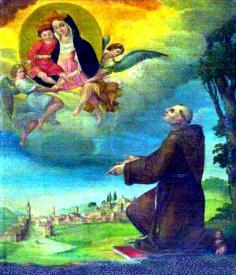 Blessed Francis of Calderola was also a very devoted servant of the mother of God, the Queen of Peace. With his own hands he carved a statue of Our Blessed Lady, which he presented to a confraternity he had founded. Because of the many miracles that were worked through its means, it became renowned as a miraculous image. On his return from exile in France in 1814, Pope Pius VII himself placed a golden crown on the head of this statue in the church of St Nicholas of Tolentino. After Father Francis had reconciled many sinners to God through the intercession of the Mother of Mercy, and had exhausted himself by his great labors, he slept the sleep of the just in the convent at Colfano in 1507. The veneration that had been accorded Blessed Francis of Calderola because of many miracles was approved by Pope Gregory XVI. O God, who didst give to Thy Church a worthy servant in Blessed Francis, Thy confessor, and didst clothe him with the extraordinary grace to settle quarrels, grant us through his merits and intercession, that being strengthened in Thy love, we may never be separated from Thee by any temptation. Through Christ Our Lord. Amen.